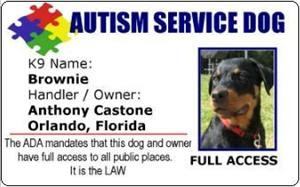 We have received many email questions asking more about obtaining an autism service dog. The information and links below may help you in your search. Workingservicedog.com does not endorse the products or services of any of the organizations below. Obtaining an autism service dog can be a lengthy process. Most training centers have wait lists of one to five years. The dog breeds most often used are Labrador Retrievers and Golden Retrievers, but you may also find mixes, Poodles, and German Shepherds. Most puppies are obtained directly through specialized breeding programs; sometimes appropriate dogs are rescued or adopted at a slightly older age. Around 8 weeks of age, dogs are placed with individuals or families who act as puppy raisers. Puppy raisers have the responsibility of socializing the dog to as many types of people, places, and situations as possible. As the dog enters adulthood, he or she is returned to the training center for a period of extended, intensive, and specialized instruction. Autism service dogs are ready to be placed between the ages of 18 months and 2 years of age. Each training center has its own guidelines for placing dogs. Some training centers provide dogs free of charge; others require a contribution on the part of the individual receiving the dog. Many will assist with fundraising to help defray the cost of the dog. Be sure that the organization you choose to work with is established as a 501 (c) non-profit organization.